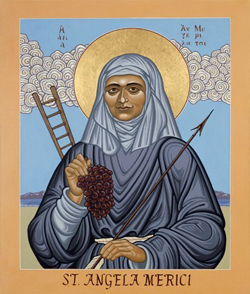 Angela Merici was born on March 21, 1474 at Desenzano, Lake Garda, Italy. She made a vow of virginity before she was ten years old, and persuaded her older sister to do the same. Her parents died when she was only ten years old. Together, with her older sister, she moved to the nearby town of Salo, to live with her uncle. She and her only sister, who was three years older, loved each other very much. But soon the sister of Angela followed her parents by a sudden death. Her sister's tragic death left Angela disconsolate because it occurred before her sister could receive the last sacraments of the Catholic Church. Angela lost herself in prayer and good works. Although she had great faith, she could not help but wonder if her sister was safe in heaven. One day during harvest, Angela was alone in the fields when she experienced a life-changing vision: the heaven’s opened and angels and young women came toward her singing a melody, surrounded by light. One of the young girl's was Angela’s sister and she spoke, telling her that God wanted her to establish a company of consecrated virgins. Since then she has been known as a Saint, thanks to her spiritual life and her capacity to understand and help people. In 1516, on invitation, Angela moved to Brescia, for a consolatory mission in the house of Caterina Patengola, who had lost her husband and two children. Here she met Giovan Antonio Romano. Soon a group of people formed around her, united by the same desire for good. In 1524 Angela embarked on a pilgrimage to the Holy Land and a year later she went to Rome to the Pope for the Jubilee. 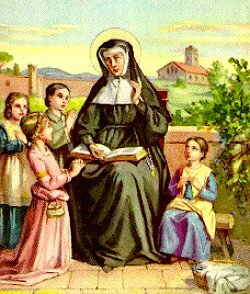 On November 25, 1535, on Saint Catherine’s day, Angela and 28 young women formed the Order of Ursulines in honor of St. Ursula in a small house near the Church of St. Afra in Brescia. In 1536, Merici laid down the rules of the Ursuline Order, clarifying her plan to restore the family and the supremacy of Christianity through the education of girls. In 1537 she was elected superior of the company by unanimous vote. Before her death she dictated her Testament and Souvenirs, which contain her counsels to her nuns; they insist on interest in the individual, gentleness, and the efficacy of persuasion over force. In 1580, Charles Borromeo, Bishop of Milan, inspired by the work of the Ursulines in Brescia, encouraged the foundation of Ursuline houses in all the dioceses of Northern Italy. Charles also encouraged the Ursulines to live together in community rather than in their own homes. Angela died on the 27th January 1540 at Brescia and was buried in the ancient church of Saint Afra (now Saint Angela’s sanctuary), where she still rests. She left 150 spiritual daughters. On June 9, 1544, Pope Paul III approved the new institute with the Bull: “Regimini Universalis Ecclesiae”. She is beatified on April 30, 1768 by Pope Clement XIII and canonized on May 24, 1807 by Pope Pius VII. In 1962 St. Angela Merici was proclaimed the principal patron of Desenzano by a decree of the Sacred Congregation of Rites. In 1861, Pius IX extended her veneration to the universal Church. Saint Angela's body is incorrupt. After Angela's death the Company of Saint Ursula spread rapidly. Ursuline communities were established quickly in France, Germany, Belgium, Holland, Switzerland, Canada and the United States. Today, thousands of Ursuline Sisters work to proclaim the Good News of Jesus Christ on six continents. "We must give alms. Charity wins souls and draws them to virtue." "Mothers of children, even if they have a thousand, carry each and every one fixed in their hearts, and because of the strength of their love they do not forget any of them. In fact, it seems that the more children they have the more their love and care for each one is increased." you were not afraid of change. Help us to overcome our fear of change in order to follow God's call and allow others to follow theirs.